The U.S. stock market indexes lost 0.4-0.9% on Wednesday, retracing some of their Tuesday’s move up, as investors’ sentiment worsened again following Syrian conflict escalation worries, among others. The S&P 500 index is currently trading 8.0% below its January 26 record high of 2,872.87. The Dow Jones Industrial Average lost 0.9%, and the technology Nasdaq Composite lost just 0.4%, as it was relatively stronger than the broad stock market yesterday. 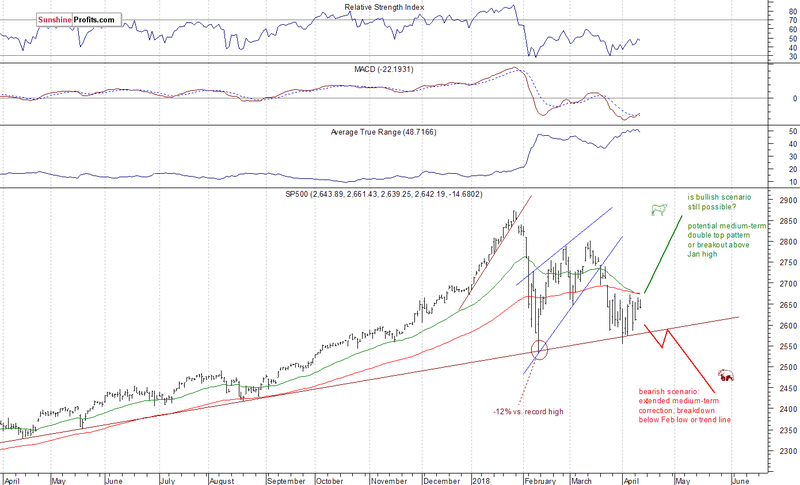 The nearest important level of resistance of the S&P 500 index remains at around 2,665-2,675, marked by recent local highs. The resistance level is also at 2,695-2,710, marked by March 22 daily gap down of 2,695.68-2,709.79. On the other hand, level of support is at 2,635-2,640, marked by local lows. The next support level is at 2,600-2,610, marked by Monday’s daily low, among others. Will Earnings Releases Outweigh Negative News? The index futures contracts are trading 0.4-0.5% higher vs. their Wednesday’s closing prices right now. So, expectations before the opening of today’s trading session are positive. The main European stock market indexes have gained 0.1-0.3% so far. Will stocks take another attempt at breaking above their short-term consolidation? It may happen if sentiment further improves ahead of coming quarterly earnings releases. Investors will also wait for the Initial Claims number release at 8:30 a.m.